A brief account of starting a band in the West Country by Reuben Archer. In the 60s I attended Kingston Art School, and for a few years knocked around Richmond and Kingston with Eric Clapton, Dave Brock and Keith Relf. My father was head of the school and was always against me wanting to start a band. I was there to work, and so it wasn't until much later in my life that I picked up a guitar and decided whatever the odds, rock and roll was for me. In fact when my father and other tutors decided Eric wasn't ever going to knuckle down and work, he just wanted to play his guitar, they ended up by asking him to leave the school. 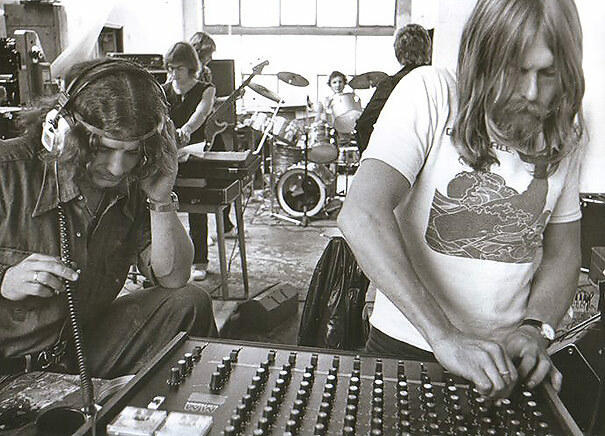 Keith subsequently went on to form the Yardbirds, and Dave formed Hawkwind, so for me, any temptation to go in that direction was subsequently removed. In 1973 I moved to Shepton Mallet from London. We bought a De-commissioned Georgian pub in Stony Stratton and commenced turning it into a house. It was whilst living there that I bought two electric guitars, a Gibson SG copy for myself, and a Fender Strat copy for my Stepson Laurence. I could play a bit and immediately started to teach Laurence my limited repertoire of chords. Within a couple of weeks Laurence had mastered all that and much more, and within 3 months was playing fluently. We looked around for other local musicians and found a bass player who I can only remember as Gibb, and a young Welsh Drummer whose name also escapes me. We played in a local pub on the Fosseway called the Cross Keys, and it soon became a regular gig of ours. The band was named Shady Business and the landlord was only too pleased to find that whenever we played, the venue was always packed. If Shady Business had any claim to fame, it was probably being asked to play at the Pilton Festival, which was staged on Mike Eavis's farm. A few years later this little festival turned into one of the biggest events on the music calendar, Glastonberry. Over the next year the band evolved, and a new drummer joined called Andy Peyton, along with Bassist Simon Ridler, the son of Evercreech's Vicar evolved. This line up was renamed Thriller. Thriller played several Pub venues and others like Street's Hall and Yeovil's Johnson Hall. We then hired the Showering, Shepton Mallet Centre to play a live show for the purpose of recording the set with a mobile unit. The show sold out within a week, and four tracks were successfully recorded. A local solicitor who had connections in the music biz attended and as a result signed the band for management, later taking us up to Manchester to Revolution Studios to record. Revolution had connections with the successful Strawberry Studios where Sad Cafe recorded. The Revolution session turned out well with the most successful tracks being ‘Midnight At The Moulin Rouge' and ‘Red Light Ruby' both written as a concept idea for an album based on Toulouse Lautrec, as we had now decided to re launch the band calling it LAUTREC. When I had made the move from London to The West Country, it had been to take up a new Job, designing and building the new Geology Gallery at Bristol Museum and Art Gallery. That was completed in about two and a half years, and with no more exciting projects in the offing, I moved to Westland Helicopters as a graphic designer, as it was nearer to Wincanton where we had subsequently moved. It was at this point that Laurence asked me if I thought we could really make it in the music biz' I told him of course we could. We would play Bristol Granary, Colston Hall, and then Hammersmith Odeon and The Rainbow. Brave words indeed, but they weren't in vain because with the exception of the Rainbow, we would go on to play all the other venues and many more both in the UK and abroad. Lautrec had a new line up featuring Simon Riddler, Laurence and myself and Steve Holbrook on keyboards, and Clive Deamer on drums, both hailing from the Frome area. Clive Deamer went on much later to play for Portishead and also The Robert Plant Band. He is a very busy session drummer and in high demand. Having already mentioned the Bristol Granary, I would like to add that if it hadn't been for Les, and I must apologise as I never knew his surname, we probably would never have achieved the profile that we did. I always thought Les, a middle aged tall man, always dapper in suit and tie, looked a little out of place for a rock club owner, but he ran the Granary in a strict business like fashion, and was always fair. Les gave us many opportunities to play his club, and consequently, we built up a great following. 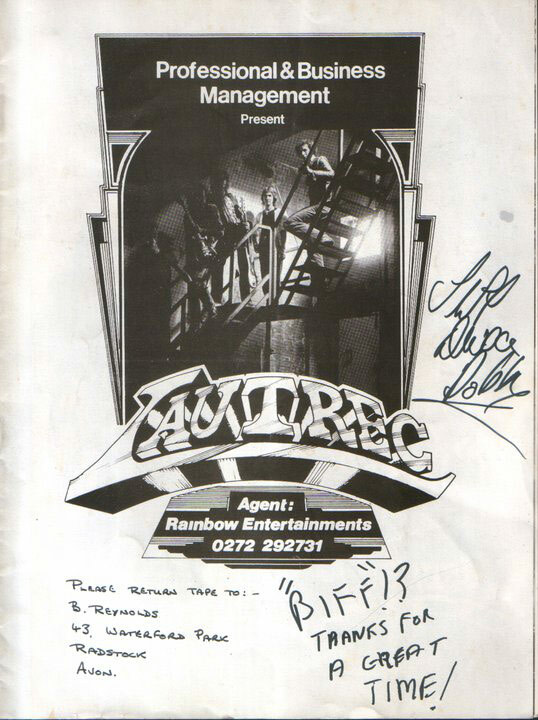 At this point Lautrec was waiting on a decision from Island Records, who were interested in signing the band, and as a result of their interest we embarked on a tour of UK city halls, with Saxon, who were about to break with their first major album. It was during this tour that Laurence and I realised we needed to alter direction somewhat if we were going to appeal to the Heavy Rock fraternity. Unfortunately for us at this point Island declined to sign the band, as on his return from Jamaica, Chris Blackwell, owner of the label decided to drop the rock bands he already had from his roster, and had no wish to sign another. At the end of the Saxon tour, Lautrec sought new management, finding John Glover of Fat Cat management and the Street Tunes Label. 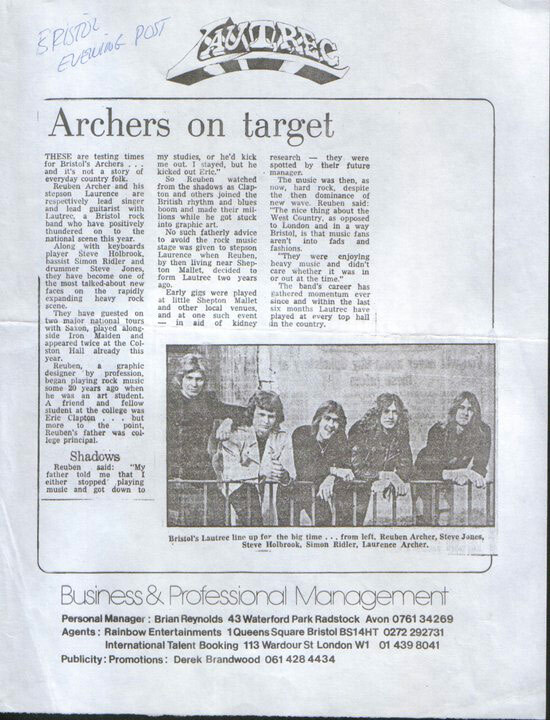 The band went into Rock City Studios at Shepperton to record two songs, ‘Mean Gasolene' and ‘Shoot Out The Lights', which incidentally are now two of the rarest records of the so called NWOBHM period fetching up to £1000 apiece. At this point Lautrec were offered the support slot for the next Saxon Tour, and on accepting found that for personal reasons Clive Deamer the drummer, could not participate. 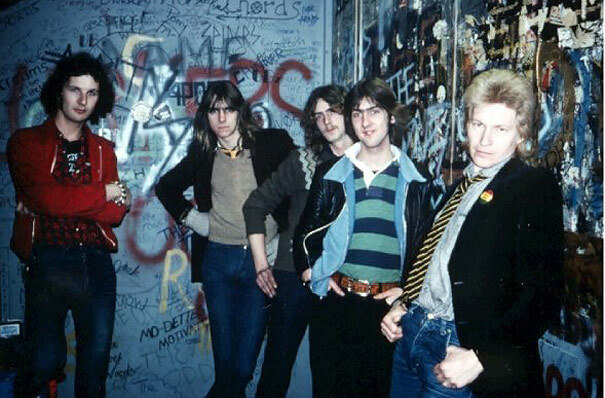 With one week to go before the first date, and as a result of a tip from Trevor of Otto's drum store in Hotwells, the band recruited Bristol based drummer Steve Jones as a replacement, and successfully completed the tour. Saxon hit the charts with Wheels of Steal, taking a break on the tour to record the song for Top Of The Pops. During this period Lautrec also made a TV appearance on BBC RPM show with a live performance of ‘Midnight At The Moulin Rouge' and ‘Shoot Out The Lights'. During the recording all the BBC staff were made to wear ear defenders, as up until then, they had never recorded such a loud band. It was some time after all this that I decided to accept an offer from Saxons management to join a new so called supergroup called Lionheart, formed around the guitarist Dennis Stratton, formerly of Iron Maiden. They wanted a vocalist and songwriter, and they thought I would fit the bill. We toured the UK in our own right, supported Whitesnake on two tours, and recorded demos for EMI. I penned several songs one of which being ‘Dangerous Games', which was later re-recorded for a Lionheart Album. After around six months I left the band, feeling that Lionheart was not for me. Shortly after this, I was approached by Jimmy Bain ex Rainbow, and then of Wild Horses. He needed a vocalist to complete the new Wild Horses Line Up. As it turned out, he also needed a drummer and guitarist, as Brian Robertson had left along with drummer Clive Edwards. Laurence was having little luck with Lautrec at the time and had all but given up on the band. Don't forget at this point Punk was becoming established, and Heavy Rock was taking a back seat with the emergence of hundreds of New Wave bands. It was becoming really hard work trying to break a Hard Rock Band. I asked him to join Wild Horses along with Lionheart's ex drummer Frank Noon, and we commenced rehearsing and recording for EMI immediately. After two residencies at London's Marquee Club, where Phil Lynott would often get up to jam with us, we realised things were going nowhere. Horses were managed by Morrison O'Donnell, who also managed Thin Lizzy, they should have cracked the situation for the band, but were beginning to have reservations about Jimmy. After several months of nothing happening, Laurence, Frank and myself decided enough was enough and quit to form our own new band. It was at this time that we did an interview for the music journal Sounds and also Kerrang Magazine. The Journalist asked me what our plans were and I mentioned that we were forming a new band. What's it called she asked? I was stumped. Thinking fast I thought of Wild Horses, and the fact that we couldn't get out of that situation fast enough. So, what do wild horses do ?....they Stampede!! And straight away I told her the new band was called STAMPEDE, and that's how things started for us. Still based in Bristol although spending more and more time in London, trying to find representation, Stampede went into Bristol's Cave studio to record new material. Personally I loved that little studio and the two guys who ran it. They did everything they could for us, it was like nothing was too much trouble. Cave was an eight track studio, so you had to be pretty careful about how you went about things. Overdubbing was hard, because of the limited amount of tracks available, and you really had to plan things out before going for takes. At the end of the sessions we had five tracks ‘Missing You', ‘Days Of Wine And Roses', ‘Moving On', ‘Hurricane Town' and ‘Photographs'. There were others, but these were the tracks that eventually got us signed to Polydor. During this time we had also been talking to a guy called Roy Ward with a view to him managing us. He looked after Ginger Baker, and we often rehearsed in his studio in Acton, London. Finally I was recommended to Ronnie Fowler, who for years had been right hand man to Don Arden. Don had wound up Jet Records, and Ronnie had decided to go on his own and find a band to manage and promote. Ronnie secured the deal for Stampede with Polydor Records and the first record we released was a four track EP of the songs recorded at Cave studios. 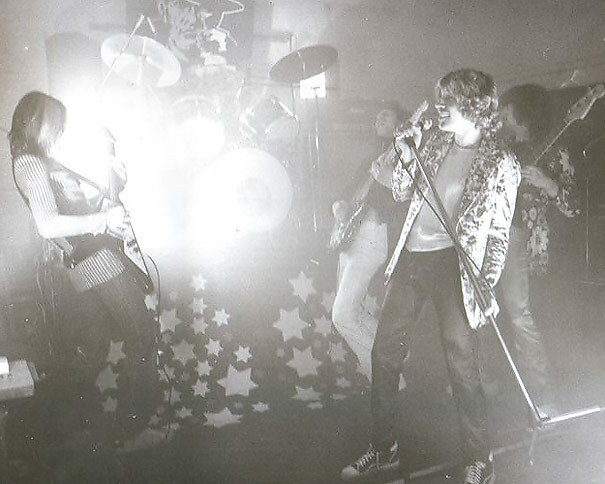 There followed several singles and when Stampede played Reading Rock Festival in 82' Polydor employed the Rolling Stones Mobile Studio to record our live set. They also recorded the Mildenhall Festival performance and released the album as the ‘STAMPEDE, THE LIVE BOOTLEG'. Four months prior to this I was running with Maiden's Bruce Dickinson, when I fell and broke my hip and thigh. Banged up in hospital I spent the time writing lyrics for the next album, and managed to get out in time for the Reading appearance, which I did using the mic stand in place of my hospital issue crutch. When we originally formed Stampede, the line up consisted of myself vocals, Laurence on guitar, Frank Noon on drums and Alan Nelson, from Franks old band Wildfire on keyboards. We needed a bass player, and recruited a French guy called Francoise Maureau. Francoise just didn't gell and the language problem was a nightmare, so we advertised auditions in the national music papers. There followed daily sessions which lasted for several weeks, until we finally narrowed the list down. One of the listed players called me to find out if the band had made its decision and told us he was playing a gig in his hometown of Bristol that very weekend. 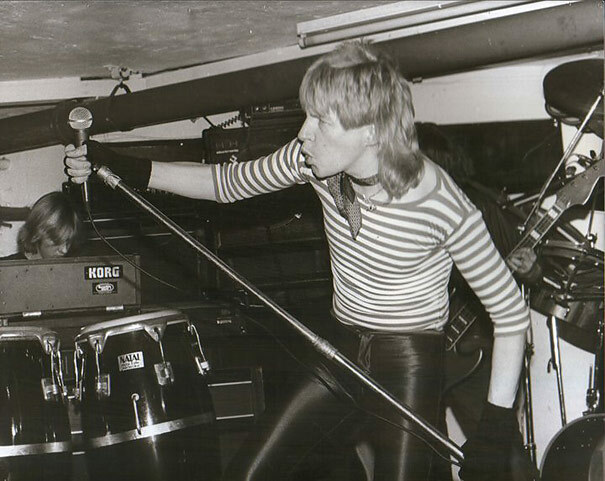 The gig turned out to be open air in a street behind Kingsdown Parade in Bristol, where I actually lived at that time. Laurence and I made the trip back from London to catch Stormtrooper with Colin Boggy Bond on bass. 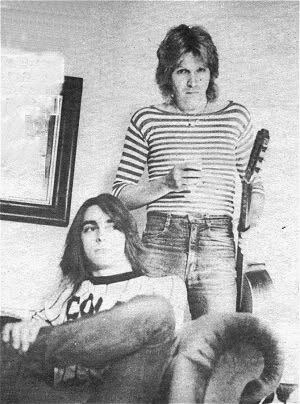 It was plain even then to see that Boggy was heavily influenced by Rush and Geddy Lee, he played a Rickenbacker bass, and Taurus pedals. He not only played great, but looked every bit the part, and a little later on over a few pints of cider, we asked him to join Stampede. The line up was complete and we immediately began intensive rehearsals at the Ritz rehearsal facility in Putney, London. This meant that Colin would have to move to London on pretty much a permanent basis and it wasn't long before we all found ourselves renting apartments in a huge Victorian house rented by Frank Noon in Isleworth Middlesex. The Grove was a haven for rock musicians and at one time amongst the residents were Rocky Newton, Lionheart and later of the Michael Schenker and Robin McAuley Group. Bernie Torme, Electric Gypsies, John Lockton, Wild Horses, myself, Stampede and Joe Elliott, Def Leppard. I was already well familiar with Joe and Leppard because Lautrec had supported them at Bristol's Colston Hall. It was there that Rick, their drummer had found all his bass drum pedal straps frayed. I drove him down to Otto's to get some new ones. Trevor the owner told him to go next door to the Army surplus store and buy a length of webbing, That way he could just cut off lengths as he went along...much cheaper and stronger. Over the next couple of years we became good friends with the band, and of course an even stronger connection was that Frank Noon had been their first drummer before they made it big. It was a similar situation with UFO. I had taken Laurence to Colston Hall to see them when we were first forming Lautrec. I remember thinking that this is the kind of band we should be. Hard melodic rock . I still love that band to this day and they became good friends and of course Laurence went on to do several tours with them and record two albums. At first with Stampede, I became a little miffed at the similarities drawn by rock journalists of Phil Mogg and myself. The fact was at that time, on stage we did look quite similar, and sang in the same kind of vocal range. Plus Stampede songs were melodic and although not by design did fall into the UFO category. However as far as I was concerned UFO had been on the road since the late 60s and despite lineup changes had survived, making great music. If we were likened to them in any way so what? I personally took it as a compliment. Of course the other comparison came from Laurence's guitar work. He always had been a Schenker fan. It wasn't surprising then that years later he would gig and record with UFO. Shortly before Stampede's Reading appearance there were two drastic changes to the line up. Drummer Frank Noon left to join up with Bernie Torme and the decision was made to dispense with the keyboards. Colin Bond introduced a young guy from Bristol called Eddie Parsons who turned out to be exactly the power house drummer the band needed. 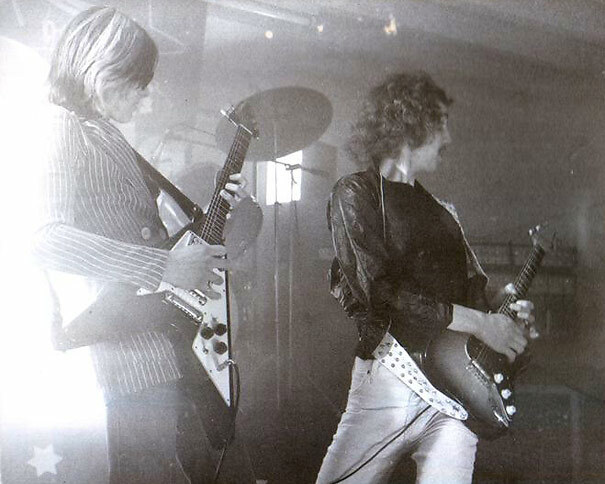 As a four piece Stampede functioned far better as a unit and after two weeks of intensive rehearsals the Reading appearance went off without a hitch, earning the band some really great press reports, as well as achieving a good live recording in the can for a later release. What we didn't know at the time was that Polydor would put this recording out as the band's first album. Consequently when we did get to record a full studio album we found it impossible to recreate that wonderful live feel and in comparison we always felt that the following studio album lacked urgency and energy. Stampede followed all this up with a couple of tours with Gary Moore, played some gigs on the continent and commenced writing a new album. During the following months it became clear that Polydor was not really a label geared for handling a rock band, they wanted singles and more singles, and couldn't understand why a band like us needed support for touring. Most of their energy went into other acts on their roster like Bryan Ferry. With changes going on in Polydor's A&R department along with all the internal politics, Stampede became disillusioned with the contract. I decided to call the whole thing a day and anyway was due to go back into hospital to have the metal pins removed from my hip and thigh. During my operation I contracted an infection and on coming out became really ill. In fact if I hadn't received immediate medical attention I would have actually died. At times like this one's confidence can be reduced to an all time low, and as a result I decided to finish with the music biz' completely. For the next eighteen years I built up my design business and in 2000 was talked into starting a local band called The Boogeymen. This ran for five years during which we recorded two albums. In 2004 my wife and I both being into the blues formed our own band the Archer Marriott band, playing gigs throughout the Midlands and North of England. In 2008 Rock Candy Records re-released our last Polydor album Hurricane Town. Following this pretty much all our back catalogue was re-released in the UK, Europe, Japan and the USA. As a result of this I called up Laurence and Colin and we staged a reunion gig at London's Embassy Club. The gig was well received by the press and public, so we decided to keep things going and record a brand new album. The new record is called ‘'A Sudden Impulse'' and comes out in April 2011, on The Rock Candy Label, with two single releases prior to that on the Internet. We will be touring to promote the album and one of those dates will be a Bristol venue. During the summer of 2010, Stampede played the Back Bar in Weston Super Mare. The gig was packed and amongst the audience were the original members of Lautrec. We had a great night and will be back there in April 2011. In retrospect I couldn't conclude this potted band history without saying that Laurence and I owe a lot to the West Country and especially Bristol. We started our musical journey there and made many great friends in the process. I lived in the town itself for five years, and still love going back there. Stampede info can be found on myspace: stampedeofficial. Facebook stampederock and Reuben Archer. A new stampederock.com site will be up and running in January 2011.